Villarreal have been fined €12,000 (£9,850) by the Spanish Football Federation after a fan threw a banana at Barcelona defender Dani Alves. The Brazilian, 30, picked up the banana and took a bite as he prepared to take a corner in the La Liga match between the sides last month. "We have accepted the €12,000 fine," a Villarreal spokesman told Reuters. "The federation were though pleased with the quick and positive action that the club took by identifying the fan." 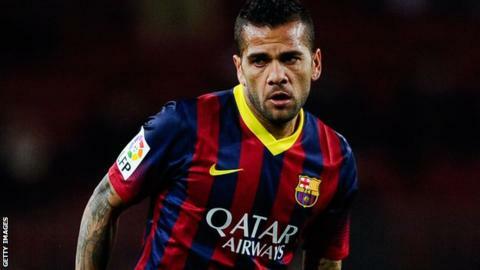 Alves' actions sparked a worldwide social media campaign against racism following the match, which Barcelona won 3-2, at Villarreal's El Madrigal stadium on 28 April. Within two days of the incident Villarreal said they had identified the culprit, withdrawing his season ticket and giving him a lifetime ban. Spanish police then arrested the 26-year-old man, identified by local media as David Campaya Lleo. The Spanish Football Federation said Villarreal were fined for the supporter "committing an act of contempt or disregard concerning racial or ethnic origin towards an adversary". Ex-Sevilla player Alves, who has been named in Brazil's preliminary squad for the 2014 World Cup, said the fan should "be publicly shamed" and criticised Spain's attitude towards racism. On Sunday, Levante midfielder Papakouly Diop said he was the target of monkey chants from Atletico Madrid fans after his side's 2-0 win over the La Liga leaders.